Playing on the NHL's most popular team, Phil Kessel rookie cards get plenty of attention. But with the Toronto Maple Leafs still without a Stanley Cup win in decades, there's room for his hero status to rise even further. Like Doug Gilmour and Mats Sundin before him in recent history, fans and collectors are looking to the sniper to bring the Cup back to Toronto. Shop for Phil Kessel rookie cards on eBay. The price the Toronto Maple Leafs paid for Phil Kessel was steep. And we're not talking contractual obligations either. After just three seasons with the Bruins, the team that drafted him fifth overall in 2006, Boston sent Kessel to Toronto for three first round picks. Among them was Tyler Seguin, who helped the Bruins win the 2011 Stanley Cup. Since arriving in Toronto, Kessel has been one of hockey's top scorers but he hasn't emerged as one of the NHL's elite, at least from a hobby standpoint. Should Kessel up his game, which he is showing signs of doing, and the Maple Leafs make a deep run into late spring, Kessel's hobby fortunes could change in a hurry. But those are a couple of major ifs. 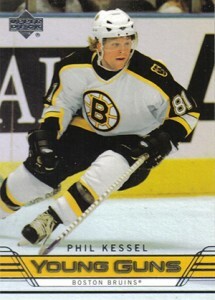 Collectors have a wide variety of Phil Kessel rookie cards to choose from. 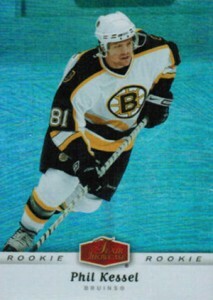 All are from Upper Deck as they held the NHL exclusive in 2006-07. Of his 20 base set rookies, just four are autographed. 2006-07 Upper Deck The Cup is the most valuable. Numbered to just 99, it has an on-card autograph and a patch swatch. BGS 9.5 PHIL KESSEL 2006 07 UD BeeHive Bee Hive ROOKIE Card PENS ! BGS 9.5 PHIL KESSEL 2006 07 In The Game ITG International Ice ROOKIE! RARE!